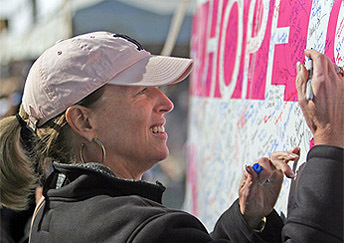 On Sunday, October 20th, thousands of women and their families will gather at the Silver Lake Parking Lot in Point Pleasant Beach, NJ, to take a walk that declares their determination to fight breast cancer. Collectively, they will have raised millions of dollars that will be dedicated to research and helping women who are facing this disease. The Making Strides Against Breast Cancer walk is an opportunity for us to come together as a community to show support for each other and to truly make a difference. Many have already started fund raising and training for this inspiring event. You can sign up now to walk or volunteer. ella health is a sponsor, and we will be there to cheer you on. Before or after the walk, please stop by the Breast Health Tent to say hello.